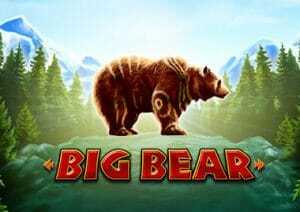 Join the wild beasts of the great American wilderness in Big Bear, a 5 reel, 243 ways to win video slot from Playtech. The highlight of this nature-themed game is the bonus round which allows you to pick from a trio of free spin and wild multiplier combinations. Look out for the locked wild respins in the bonus round that can send payouts rocketing by up to 36x. Stakes start at 10p, rising to £500 per spin. There’s nothing too flashy about the design in Big Bear but the colourful visuals are decent enough. With a forest in the background, you’ll see lower value A to 9 symbols as well as more valuable wild animals symbols. They include fish, beavers, big cats and wolves. The eagle is the most rewarding of the standard symbols. You fly off with an award of 1, 3 or 10 times your total bet if you land 3, 4 or 5 of them on adjacent reels on the same spin. Appearing on reels 2 and 4 only is the roaring brown bear which is the game’s wild. This substitutes for all other symbols bar the scatter and really comes into its own when you trigger the Free Games feature. To do that, you’ll need to land 3, 4 or 5 of the paw print drum scatter on the same spin. Landing 3 or more scatters results in a retrigger and another round of free spins. Simple it might be but there’s plenty to like in Big Bear especially in the Free Games feature where the wild multipliers and wild respins can really get the coins flowing. If you like the great outdoors and the nature theme, then the Big Bear and friends can deliver some impressive action. I also recommend you try Blueprint Gaming’s Buffalo Rising MegaWays and Playtech’s Roaring Wilds.